Greek knife from the Isle of Crete. Inscription on the blade in Greek script says "Khanya Kriti" (looks like "Xavia Kenin" to English speakers), and indicates that the knife was made in the city of Khanya. The engraving is a rough outline of the island, and the knife is dated 1951. 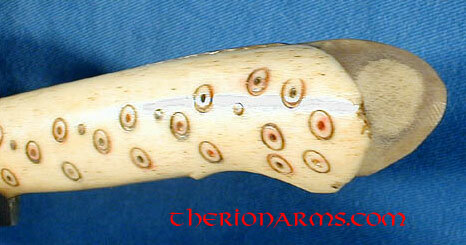 Hilt has traditional "two eared" style reminiscent of Turkish yataghan, and is most likely goat or cow bone with a working-life repair to one side of the v-notch. The Cretans have been known as "the people of the dagger," as the German occupiers during WWII found out. Knives are worn as part of male and female folk costume, and knife making and decoration is a handicraft relatively widely practised.